The Deanna K. Isaacson School of Midwifery in Zwedru, Liberia, was dedicated May 20, named for the ELCA missionary who helped develop and manage it. When 43 midwives graduated from a three-year midwifery training program in Liberia on May 20, a 44th person was honored: the late Deanna Isaacson, an ELCA missionary from 1966 to 2000. 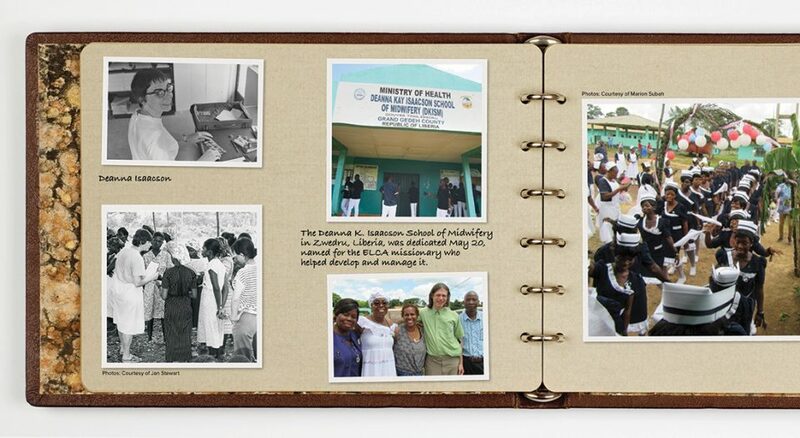 The school, operated by the Liberian Ministry of Health, was renamed the Deanna K. Isaacson School of Midwifery to honor the woman who helped develop and manage it beginning in 1983. The Isaacson School is in Zwedru, Grand Gedeh County, and serves six counties in southeastern Liberia, a rural region where access to health care can be problematic. For Liberian women, the presence of a certified midwife can make the difference between life and death. Midwives handle all aspects of a delivery except caesarian sections, and they can safely treat hemorrhage, sepsis and other situations that might otherwise trigger maternal death. In a country with one of the highest maternal mortality rates in the world, “we are vulnerable because we don’t have enough doctors and less than half the number of midwives that we need,” said Marion Subah of the Human Resources for Health project of the Maternal and Child Survival Program in Liberia. Graduates of the Isaacson School will help close that gap. As a new graduate of nursing and midwifery, Isaacson was “surprised to learn upon arrival that I was expected to teach in a midwifery and practical nursing program at Curran Lutheran Hospital in Zorzor,” she recalled in a letter to congregations in 1999. Besides teaching and training midwives at hospitals of the Lutheran Church in Liberia, Isaacson designed curricula and organized hospital staffing and procedures. In the 1980s, as a staff member of the Christian Health Association of Liberia (CHAL), she was recruited to help launch the new Midwifery Training Program–South Eastern Region in Zwedru. Opened in 1983, the school graduated a steady stream of capable, certified midwives until Liberia’s long civil war forced it to close. Later Isaacson was evacuated, but she returned to participate in a Catholic Relief Services assessment team designing a food distribution system for people affected by the first wave of the war. The Isaacson School reopened in 2008, thanks to partnerships between the Liberian Ministry of Health and Social Welfare and international donors. It began graduating students again in 2011. During the graduation and dedication ceremony, traditional dancers and fanfare greeted graduates, their families and dignitaries. Isaacson’s nephew Lee spoke about his aunt’s life, and Sumoward Harris, retired bishop of the Lutheran Church in Liberia, led the prayer of dedication.